When you look outside, it is hard to believe that warm weather will ever come back to the area. Last night, they mentioned that it has now been 14 straight days since we have had temperatures over 32 degrees. I guess that would explain why the mounds of snow are not changing and it keeps adding up. Did you know that today is a holiday? Today is Tu B’Shvat. What is Tu B’Shvat you ask? It is the New Year of the Trees, when new fruits are beginning to form. Kind of hard to believe if you live in certain parts of the world stuck in winter, but it is true. In Israel, spring has already started. On this day in Israel people will plant trees outside. In the United States, we often create fun projects for children to plant some seeds. Around here we often grow parsley inside to use for our Passover seders in a few months. In addition to planting trees, we also taste new fruits during Tu B’Shvat. Items like almonds, figs, carob, and dates that are native to Israel are common. 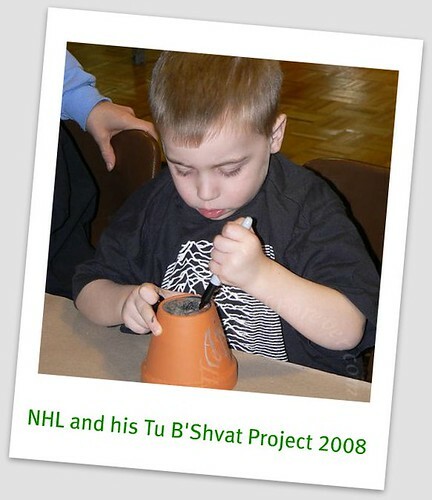 On Tu B’Shvat we also spend time thinking about ways to help our planet like with recycling and saving energy. I know that JSL will be celebrating the holiday at nursery school tomorrow. It will be interesting to see what they do. What are your plans for Tu B’Shvat? Even if you do not celebrate, I would love to know.